the AW16G, has been designed to compete with the likes of the Korg D12 and Zoom MRS1044, although it does offer a full 16 tracks of audio. The AW16G provides a 16-track digital recording environment, with a maximun of eight able to record at one time. 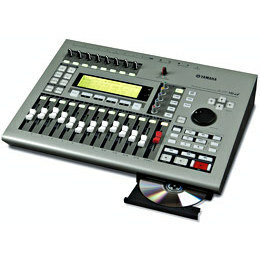 sampler facility, and a CD-RW drive for backup or for burning audio CDs. In comparison with the more expensive units, there are a number of obvious differences in the key features of the AW16G. All audio is at 16-bit/44.1 kHz. The LCD display is very smooth and easy to navigate, making it a pleasure to use. and without stealing recorder playback tracks. It’s possible to synchronise the AW16G with the playback of an external device such as a MIDI sequencer via MIDI Time Code or MIDI Clock. All of these settings can be configured from within a single set of screen options accessed via the Utility button. Technology truely has come along way since the days of the four track recorders, which would cost ten times what you will pay for the AW16G. I find it remarkable that a whole recording studio can be packed into something the size of a pizza box!